"We Provide Premium-Quality, Competitively-Priced IT Services to both Business and Residential Customers!" J. H. BARNES & ASSOCIATES, LLC. is an Arizona-based corporation that has been in business for more than sixteen years. JHB&A has been a Microsoft Registered Business Partner since 2004 and also have strategic partner relationships with other industry-leading companies such as CISCO and Intel. We provide a complete-range of premium-quality, competitively-priced services to our small business, home-office, and residential customers. 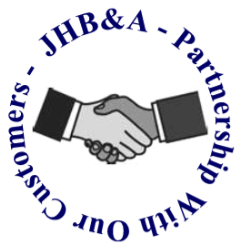 All JHB&A products and services are unconditionally guaranteed, and the success of our business is based upon forming a long-term "Partnership With Our Customers". Installing and configuring all camera software and utilities needed to view your cameras locally on your PC, MAC, or iPad. Configuring your wireless router and/or Internet broadband modem with all required options required to enable the viewing of live videos from your surveillance cameras over the network with your iPad, iPhone, tablet, and smartphone. Configuring firewall security in your router, modem and camera systems to ensure that only you (and others that you authorize) are able to view your surveillance cameras locally and/or over the Internet. Providing optional remote access to your wireless router and/or broadband modem that will enable you to obtain free surveillance camera technical support for one full year. We provide expert network configuration and integration, and online technical support for all leading brands of wireless routers and broadband modems as well as CCTV DVRs and IP surveillance cameras. These wired, wireless, and Power-over Ethernet (POE) camera systems can be seamlessly integrated into your existing home or business network; and can be locally or remotely controlled and/or monitored by authorized users with PCs, MACs, iPads, tablets, and smartphones. Is Cloud Computing In Your Future? 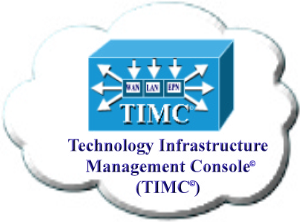 If cloud computing is in your future, JHB&A's new, revolutionary Technology Infrastructure Management Services (TIMS) can ensure that your existing network is "Cloud Ready" before you take the first step! Custom-Designed Business Website and Web Blogs from Just $49! Our core business is providing IT services to small business and residential customers. One of the key services provided by JHB&A is developing and managing business websites, web Blogs, and social networking pages. We will develop a Web Blog for your company for only $49, or a custom-designed business website for just $99. Your new Blog or website will be in production in five days or less. free phone technical support for one full year to existing customers. Our rates are among the lowest in the industry and we unconditionally guarantee all of our services. We provide free written estimates for all of our residential home networking and computer repair services. We provide a complete range of low-cost, DYI wireless networking solutions for residences, home-offices, and small businesses. 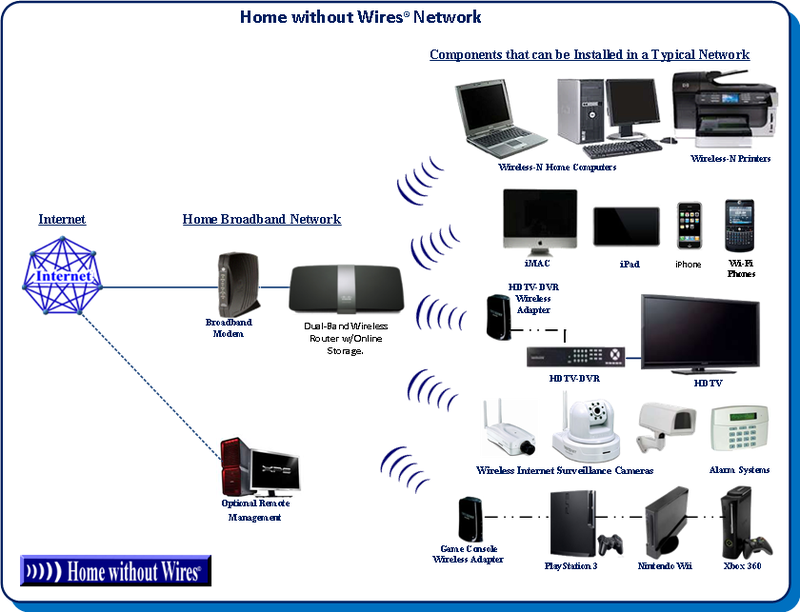 Our Home without Wires is a wireless networking solution built entirely on the IEEE 802.11N or IEEE 802.11ac standards. Our networks are based upon wireless routers, Wireless Access Points (WAPs), and wireless adapters based upon both wireless-n and the wireless-ac standards. These devices provide unparalleled speed, security, reliability, and range, at dramatically-reduced costs. Virtually all new PCs, MACs, tablets, and smartphones support these new Wi-Fi standards, and there are a multitude of wireless adapters that can be used for the older devices that do not support the wireless-N or the wireless-ac standards. 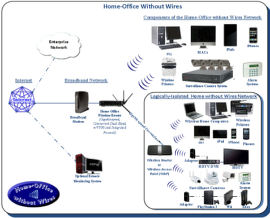 A Home-Office without Wires can potentially solve many of the cost, security, privacy, reliability, and complexity problems that have heretofore restricted the broad deployment of work-at-home and telecommuting solutions. Our Home-Office without Wires can easily be installed in any residence that has access to a broadband connection to the Internet. The only new hardware that is required is an advanced wireless-n (or wireless-ac) router that support dual-bands, VPN, and remote management. These routers are available from several leading manufacturers and generally retail for less than two hundred dollars. Click here to request free quote.